I’ve recently discovered a blogging group who goes by “Holiday Fun with our Blogging Friends” and they do themed events or even themed weeks around holidays. How could I not join the fun!? I’d already planned to do a week of carrot cake inspired recipes and figured, why not?! I didn’t link yesterday’s Cocoa Carrot Cake in with the group because it was more of a cookbook review and even though it wasn’t a sponsored post, I didn’t know if it’d be allowed in the scope of the event. Today I’m sharing Carrot Cake Pancakes from our favorite brunch cookbook Brunch at Bobby’s . We’ve made these pancakes twice. And twice I had issues with the cream cheese maple syrup. I’m sorry, Bobby, but I think there’s a typo with your recipe. Even a full block of cream cheese and a cup of maple syrup did not look like the thick syrup in that beautiful full page photograph accompanying the recipes. And I had a ton of this glaze-type sauce left over, which I used for cinnamon rolls (recipe tomorrow, so stay tuned!). In a large bowl, whisk together the flour, sugar, baking powder, baking soda, pumpkin pie spice, and salt. In another bowl, whisk together the eggs, buttermilk, melted butter, zest, and vanilla. Mix in the carrots. Combine wet ingredients into the dry ingredients. Fold in the walnuts and ginger. On a hot buttered griddle drop 1/4 C of batter into pancakes. Flip pancakes when batter starts to set and bubbles form in the center of the pancake. Cook until both sides are golden brown. **This cream cheese syrup recipe did not work, see my suggestion above. For this month’s theme of Yeasted Bundts, we have two bloggers working together to make sure reveal day goes smoothly, Felice of All That’s Left are the Crumbs and Wendy of A Day in the Life on the Farm. I have been attending a Moms bible study this year and it was my turn to bring the snack on February 28th. I originally planned to make a Cocoa Carrot Cake (you’ll see that recipe leading up to Easter). And then I realized that Febraury 28th was Mardis Gras! I changed gears and decided to make a King’s Cake. Remembering March’s Bundt Bakers theme I opted to do a bundt cake version of a King’s Cake. With walnuts instead of pecans, since I’d already bought the giant bag of walnuts for the previously mentioned carrot cake. Conveniently I had the appropriately colored sprinkles and/or sugar for decorating! And then my boys were too sick to make it to bible study. I felt (feel) terrible letting everyone down. I’ve now missed 3 weeks in a row due to fevers and colds that won’t quit. As I mentioned earlier this week, the boys both have ear infections. Now that they’re on antibiotics everyone is feeling better and I’m pumped to leave the house today for story time at a nearby light house. The silver lining of not sharing that cake with my friends was that I ate nearly the entire thing for breakfast all week. Seriously, this cake was insanely good. I loved it! Sure, it got a little stale by Saturday, but that’s nothing 10-15 seconds in the microwave couldn’t fix. The boys had a slice for breakfast on Mardi Gras. My husband had a couple of slices over the course of the week and I gave a couple of slices to a friend. Other than that, seriously, I ate it all. The kids had fun with the Mardi Gras beads all week, too! In the bowl of a stand mixer, whisk together the eggs, milk, and butter. Stir in the flour, sugar, yeast, and salt. Place the bowl on the stand mixer fitted with the dough hook. Mix on medium-low speed for 10 minutes until smooth. Transfer the dough to a lightly greased bowl, cover, and allow to rise until doubled in size 1 1/2 – 2 hours. In a bowl, combine the walnuts, brown sugar, and cinnamon. Set aside. Turn dough out onto a lightly floured work surface. Roll dough into a rectangle measuring 18″ x 14″. Brush the dough with a little bit of water. Sprinkle the walnut mixture onto the dough. Roll the dough up lengthwise like making a cinnamon roll. Pinch the edge to seal. Form the dough into a ring and place in the prepared bundt pan, seam side up. Cover and allow dough to rise another hour. Bake 30-35 minutes, until an internal temperature of 190 degrees F is reached. Allow the cake to cool 10 minutes before removing to a cooling rack. Make the glaze: Whisk together the sugar and milk. Pour over the cooled cake. Decorate with the colored sugar/sprinkles. This post is my second with the Food Bloggers Recipe Swap group and the first of the new year! So, Happy New Year everyone! Can I still say that? Has the shiny new promise of 2017 already lost its luster? Anywho… By opting in for January, I committed myself to being assigned a blog, finding and recreating a recipe from that blog, and then sharing it with all of you, my dear readers. I love the posting leniency afforded in this challenge. As long as I get my post completed by the end of the month, life is peachy! I don’t think the assignments are a secret either, and should I choose, I could search through the assignment list and figure out who is digging through my recipe index, but I won’t spoil the surprise. This month I was assigned the blog Simply Delish Eats written my Luca. Luca’s story has some similarities as mine in that she lives in California, is from the south, and is proud of her alma mater. She works in the fashion industry – a land I hardly ever delve into. Seriously, I don’t even brush my hair! Not that that means I don’t appreciate good fashion, I simply admire it from afar and from the dreamland of Pinterest. Luca has some great recipes on her blog and I actually stopped looking when coming face to face (face to bowl?) with her slow cooker queso dip. I immediately added the ingredients to my grocery list and made it for Auburn’s final game of the season. (We won’t talk about the actual game though…) I thought it’d be fun to photograph the dip in the slow cooker so when I reheated the leftovers the next day I did so in the slow cooker. And then I forgot about it. And it burned. And the already unphotogenic melted cheesy goodness was far from being camera ready. That execution fail (to be clear, the queso was tasty!) was a blessing in disguise because I got the opportunity to make this Honey Walnut Shrimp. I’ve never had the dish at a Chinese restaurant before so I can’t speak to it’s “copy cat” qualities. But I can speak to its deliciousness! With some immense luck, Firecracker tried one bite of shrimp! He never gave a clear indication as to if he liked it or not. We gave him a pair of chopsticks to make it more fun, and it kinda sorta worked. Like I said, he tried one bite. And then had a kid’s protein bar for lunch instead. Ah well. Win some, lose some, right? I made a full pound of shrimp, doubled the walnuts, and kept the sauce amount the same. To be fair, I would have doubled the sauce had I enough mayo/sour cream in my fridge, it’s not like I was trying to cut calories or anything. I only had about a 1/4 C of mayo left in my container so I had to add some sour cream. A perfectly acceptable substitution, I think! One could probably use plain Greek yogurt, too, in a pinch. Good news: I wouldn’t have needed a double recipe of sauce, it was enough to perfectly coat the 1 lb of shrimp. Luca used a boxed tempura batter. I couldn’t find any at the store, so I simply made my own. Place walnuts, 1 1/3 C brown sugar, and water in a saucepan. Bring to a boil over medium-high heat, reduce to a simmer and cook 3 minutes. Drain and place walnuts on a paper towel lined plate. Set aside. Pour oil into a wok or high sided skillet. Heat over medium-high heat until the oil shimmers and a wooden spoon placed in the oil bubbles. Make tempura batter: Whisk together flour, cornstarch, 1/2 tsp salt. Stir in seltzer. Make the sauce: Whisk together the mayo, honey, milk, remaining brown sugar and remaining salt until smooth. Did everyone end their 2016 battling sickness or is it just us? Pretty much all of November and December was spent with my boys passing back and forth some sniffles and coughs. My mom caught the head cold when she was here in early December and it clung to her for 3 weeks. And, unfortunately for Treat, it developed into an almost ear infection and some precautionary antibiotics before our holiday travel. My mother-in-law came to visit a couple of weeks before Christmas. She took a week to spend quality time with her children out in California. My sister-in-law lives in Napa working in the wine industry and we’re down in the Los Angeles area, so she took advantage and planned a multi-city travel itinerary. Firecracker simply loves it when the grandparents come to visit and has come to expect crafting projects when his Tilly (my MIL) comes to visit. Of course, she didn’t disappoint and had some adorable alphabet themed Christmas crafts to do. Crafts that have inspired me to begin planning some 2017 Christmas crafting already. (I’m just going to leave that there, chuckle at it, and land my feet on the ground knowing that’ll never happen. At least not in advance!) See my Instagram posts for adorable holiday crafting fun. My mother-in-law was coughing a little bit and her voice was starting to go. Her trip took a turn for the worse and she ended up spending her last day in California sleeping in her hotel room. Upon returning to Alabama, a doctor’s visit revealed she had bronchitis. At least we managed to stay clear of that! We then traveled to Florida for Christmas. Our 2nd day there was the start of illnesses. Treat ended up having some projectile vomiting and we weren’t really sure what to chalk it up to, thinking it was just a side-effect of his medicine, mucusy coughs, or teething. But then the next night, I was the one battling what was evidently a stomach bug. That bug continued its way through our family reaching my dad, my brother, Firecracker, and my brother’s mother-in-law, sister-in-law, and nieces. My best friend’s husband had it, too. My weakened immune system meant that I got that lingering head cold from my mom. Dad did, too. Needless to say, our holiday vacation was one spent mostly on the couch. What does any of that have to do with Creamy Walnut Pasta Sauce? Not much really. Except that the pasta I used was a package my mother-in-law found while up in Napa. 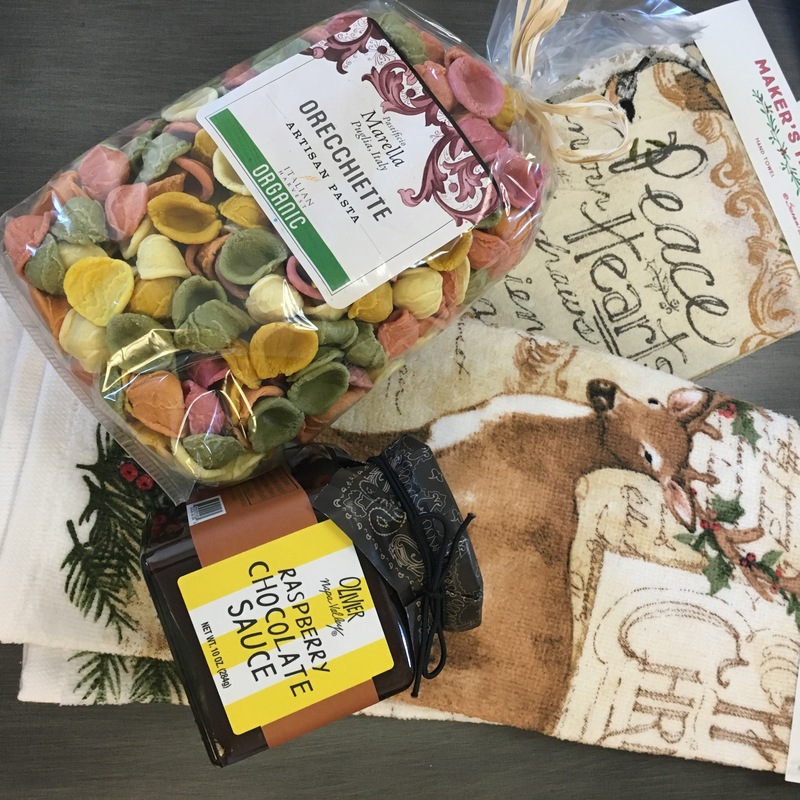 She brought me quite the fun kitchen gift set including holiday towels, colorful pasta, and a chocolate raspberry sauce. Cook pasta in boiling salted water according to package instructions. Reserve 1 C of the cooking water before draining the pasta. Toss pasta with butter and return to pot to keep warm. Put toasted walnuts, olive oil, cheese, basil, and garlic in a food processor and pulse until smooth. Season to taste with S+P. Add sauce to the cooked pasta with 1/2-1 C of the pasta water. Serve with extra grated cheese and red pepper flakes if desired.